Harrison Street from Dr Michael Debakey Drive to Grove was paved in 1925 the same year Albion Sterling King and his wife purchased the land that is now 131 Harrison. In 1940 A S King received a bid from J. J. Thompson, contractor to build the residence that is now on the property. The home was built with solid wood construction and cypress siding. Inside the foyer is an elevator with a metal accordion door and an arched walkway leading to the dining room. The property has a sunken porch on the west end and the remnants of a small concrete structure that served as a pool for many of the neighborhood kids during the 50s and 60s. Sometime in 1948 the King estate sold the home to Mr and Mrs. Joseph Petitjean. 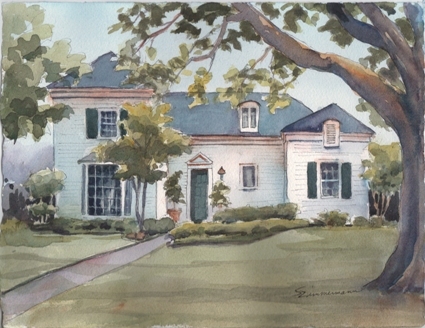 After the Petitjeans’ deaths their family donated the home and property to the Catholic Diocese of Lake Charles in 1983. There is a plaque near the front courtyard commemorating the donation. It was Bishop Jude Speyer’s residence from 1983 until 1995. During the Bishop’s residency the room above the garage was converted into a chapel with stained glass window covers. One of the covers bore the Bishop’s crest. The celebration of the Mass was held in the chapel daily. The property was sold to the Mr Robert and Dr Eileen Piper family in 1995.